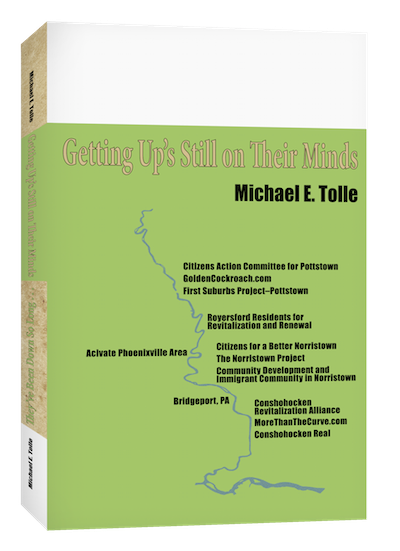 I’m pleased to tell you about a few neighbors in Pottstown, Pa. who, after realizing what was wrong, decided to do something about it. It’s a story of a small victory achieved after much effort. Pottstown should be pleased that it has such citizens. On April 15, 2013, Goldencockroach.com posted the first of what would be several articles about a woman named Tracey Accor, a single parent, and it would appear, a serial criminal, with drugs being a recurrent theme. She had just moved from one house in Pottstown—after trashing it—to another. She brought her Housing Choice Voucher with her. She had somehow managed to retain it, despite having been the frequent target of the Pottstown police and the subject of a complaint filed with the Montgomery County Housing Authority by her previous landlord. The change of address did not alter her habits, but it brought her close to residents who care about their neighborhood, and were willing to step forward and do something about it. If the May 30th inquiry was “new information,” then the MCHA was already well aware of the situation by that date. That made the delayed reply both hopeful and worrisome at the same time. A matter already underway in May might actually be close to resolution by the end of August, right? Wrong. The writer was not deterred by bureaucratic delay. He kept sending emails, to keep up the pressure. Reading them makes depressing reading, particularly when you factor in the passage of time. The resident faithfully reported a consistent pattern of misconduct that certainly included violations of MCHA regulations. In one reply, the MCHA, in a late November email, reminded the resident that even if the voucher was revoked, any eviction was solely up to the landlord, not the MCHA. Not a good sign, but our writer would not give up. Finally, an email dated December 31 from the MCHA informed the writer that as of January 1, 2015, Tracey Accor would no longer possess a Housing Choice Voucher. Remember that back in 2013 the landlord at her previous residence had filed a complaint, and that Joel Johnson had termed our writer’s intervention in May of 2014 as “new information.” Goldencockroach.com estimates that it required 2.5 years for Tracey Accor to lose her voucher, and she would know. The complaint that I was able to track required seven months, despite periodic stimulation by email. That is clearly too long. Unfortunately, I am willing to believe that it is probably the norm for such actions, even the ones that are aggressively pursued by the citizen complainers. I’m also not going to make it personal and suggest that Joel Johnson or any of his staff were deliberately dogging it. The wheels of government, as powered by Federal regulations, grind exceedingly slowly. That’s not a defense, by the way. I do not approve; I merely understand, and part of what I understand is that venting on Facebook doesn’t speed things up. And what about the owner of the building during all this time? Didn’t he know what was going on? Didn’t he care? The answer to the last two questions appear to be “yes,” and “no.” In the interest of full disclosure—and because I hold slumlords in even lower regard than I hold poverty scammers—the landlord’s name is Sam Essam Shedid (the spelling seems to vary). He bears a responsibility for what happened, but more for the fact that things continued to happen, which he did nothing about. I want to contrast his (non)reaction to what was happening on his property to the response of the owner of Tracey Accor’s previous residence, who filed a complaint with the MCHA. His name is Chris Dailey, and if I am going to publish the names of landlords who do wrong or do nothing, then it is only fair that I mention landlords like Mr. Dailey, who try to do right. So, if you’re looking for a rental property in Pottstown, you know someone to avoid and someone worth a look. This is the very definition of a “small victory.” Tracey Accor lost her voucher, which hopefully can now go to someone more honest, and these are two points to the good. On the other hand, it is unlikely that the loss has spurred Ms. Accor to more responsible behavior, so the problem hasn’t been solved. In fact, it’s just been relocated. In a final indignity, it is reported that Ms. Accor has just moved to another address, whose renter is also reputedly a voucher holder. A great many people would say that the effort wasn’t worth it. They are wrong. They are also the ones who would rather rail against the darkness than light a candle, and that is worse than being wrong. They are also the ones who have helped to render “Section 8” into the myth that it has become. So I will conclude this post with a tribute to those who are willing to make the effort for a better neighborhood. 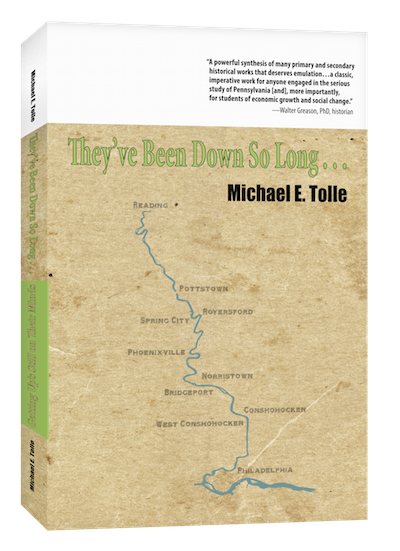 Pottstown is the better for those I have been writing about, and I continue to believe that its sister towns on the Schuylkill River that face the same problems possess such residents also. This subject can’t wait for my current every-two-weeks publication schedule, so next week I’ll take it up again, and talk about that title of “myth” I apply to Section 8, and why that is the real problem. For a great many years, I routinely drove along Ridge Pike between Conshohocken and my home in West Norriton, and thus through Norristown. Just west of the SEPTA rail crossing was a large mural, visible to those driving west, out of town. The painting was of the old Valley Forge Hotel, with an appropriately 1920s era automobile parked in front. Below it was the slogan, “Rebirth of the Past” (I never did learn the circumstances of its painting, so if anyone remembers, please let me know). What struck me every time I saw the mural was how wrong it was; the slogan, I mean. There will be no “rebirth of the past.” That past that the Valley Forge Hotel symbolizes is as dead and gone as the Valley Forge Hotel itself. The evidence is overwhelming. Industry, in the numbers and size worthy of capitalizing it, is not coming back to the Schuylkill River. Neither is the railroad network around which each town was built. In other words, the basic reasons for each river town coming into existence, growing and prospering, NO LONGER EXIST. But the towns still do; the question is: as what? If the past is not coming back, then a rebirth of the river towns requires reinvention and reuse. Here is where the Phoenixville example is useful. Its revival is internally generated, and thus can be replicated. Phoenixville also demonstrates how a part of the past can be reborn, if it is also repurposed. That part is the old downtown, the core of which in Phoenixville is Bridge Street. The downtowns in the other river towns range from empty to underutilized, but Bridge Street is alive with shops, restaurants and drinking establishments. A sure sign of prosperity is that parking is once again hard to find. A prosperous Bridge Street is the core around which literally every other component of Phoenixville’s revival is built. 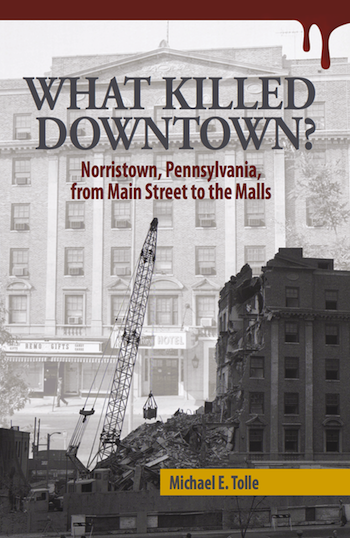 This is not exactly a secret, and that is why the larger towns—Norristown and Pottstown—do their best to promote their downtowns. The surviving downtowns are key to the rebirth of most, if not all, of the river towns, regardless of their size. Only West Conshohocken appears to be the exception, through no fault of its own. Whether Conshohocken will, at the end of the current building frenzy, actually have a downtown is yet uncertain. The future of the downtowns of Royersford and Spring City is equally uncertain, Spring City’s due to its small size, and Royersford’s due to the fact that much of its old downtown has been removed, but not replaced. Whether there is a future for a Bridgeport downtown is the most open question, a fact its residents are well aware of. It would not be too far from the mark today to label the river towns—excepting Phoenixville—as examples of what we term “bedroom communities.” That is a recent condition, however. For most of their history, each river town was a largely self-contained entity; the residents lived, worked, shopped and worshipped all within the town boundaries. But that has changed. Living in one location, working in another one and shopping in yet another one is pretty much the common theme today. The clearest examples are the automobile suburbs. Their residents live in housing developments, but they work elsewhere. They also shop elsewhere, as well as worship, and require a car to get back and forth between these activities and their homes. The result is not a community in the true sense, because as there are few opportunities for residents to relate to each other and to the condition of their common area of residence. The automobile suburbs can never be more than bedroom communities because of how they were planned. Zoning ensures a separation between residences and businesses providing services to their occupants. The businesses that provide such services are gathered into artificial groupings designed (and located) to expedite the arrival and departure of automobiles, not walkers. Any real sense of community has been rendered close to physically impossible. Our old towns are different. For those who want to avoid living in a bedroom community, the old river towns in particular can be ideal places to relocate. They are physically well suited to host a revival of community spirit, because of the closeness of everything. Their biggest advantage is their existing old (and therefore charming) downtowns. Phoenixville has an advantage here, but not a major one. It has the best preserved of the old downtowns, but Pottstown is not far behind, and Norristown possesses a small one that may be the best kept secret around. To properly appreciate how much of an asset an old downtown can be, we must first understand how much has changed since our ancestors shopped in these old downtowns. The post-World War II prosperity, unprecedented in both its amount and its spread, has fundamentally revised the ancient concept of “shopping.” The old downtowns had always offered everything, but that approach proved to be inadequate to compete with the new shopping centers and malls. Today, the bulk of our shopping for the essentials is still being done in those shopping centers and malls. But there is another kind of shopping, funded by that recent prosperity. Today, people spend more time shopping for the extras they can afford than the necessities they need. Shopping has become recreation, and as with every form of recreation, the physical environment makes all the difference. People with cash to spend prefer to spend it not just on items they want, but to do so in locations they find entertaining. A number of customer surveys tell us that charming old downtowns are excellent locations for such “boutique” shopping centers. The commercial cores of each river town used to be the place where the largest number of people interacted the most. They can be again, and you need look no further than Phoenixville to appreciate that, and what an asset an existing downtown can be. Want more proof? Get to Norristown; not its famous old Main Street, but its much less well known other shopping center on West Marshall Street. The old buildings not only remain, they are almost fully occupied, by both stores and restaurants. Walk down the great wide sidewalks and you can see the spirit of enterprise that is filling the shops, smell the food and hear music in the air. That is what I call hope for the future. Want to live in a real community? By all means visit Phoenixville and see for yourself how an old downtown has been reborn. Then check out West Marshall Street in Norristown to see one in the process. So why not Pottstown?